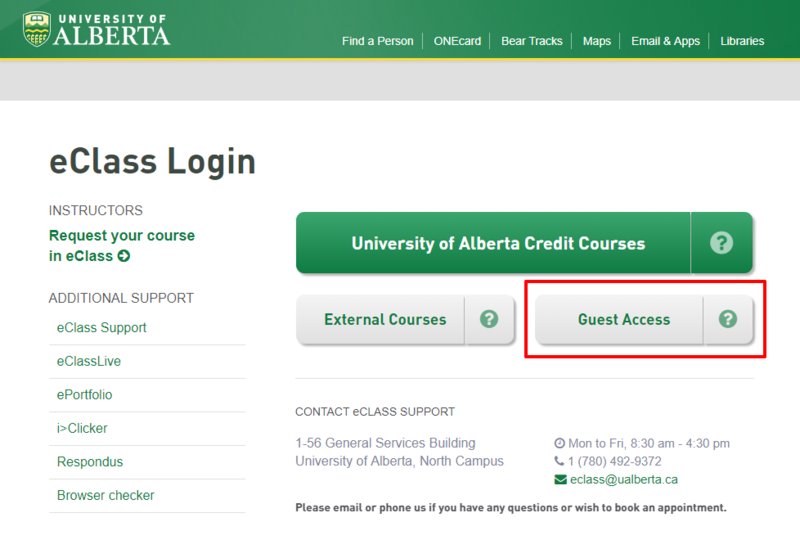 eClass allows two different levels of guest access into your Bear Tracks credit courses: 1) Access for guests from within the U of A (who have CCIDs) including teaching colleagues, faculty administrators, interested students, etc; and 2) Access for guests from outside the U of A. Both these types of access give guest users a limited set of privileges within your course that will not allow them to see any of the enrolled student names, nor any of the work submitted by students. The guests will not be able to participate in any activities you have created in your course including discussion forums, chat rooms, assignments, or quizzes. Note that allowing guests to access your course in either of the methods described below will only work if the course is already available to students -- if the course is closed because the term has passed or it is a course in the future and has not yet opened, guests will not be able to access. 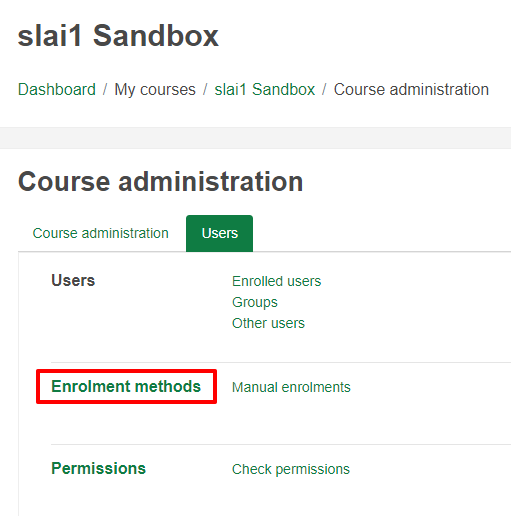 At Course Administration > Users, click the Enrolment Methods link. If the Guest Access enrolment method does not appear in the list of available methods, you need to add it. 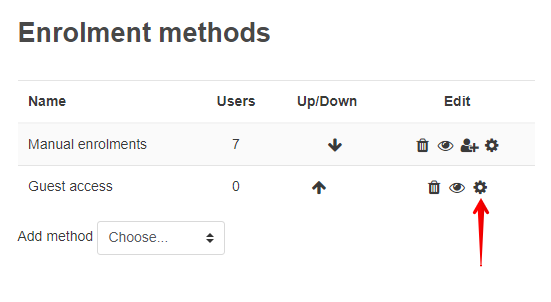 From the 'Add Method' dropdown menu at the bottom of the list, select Guest Access. 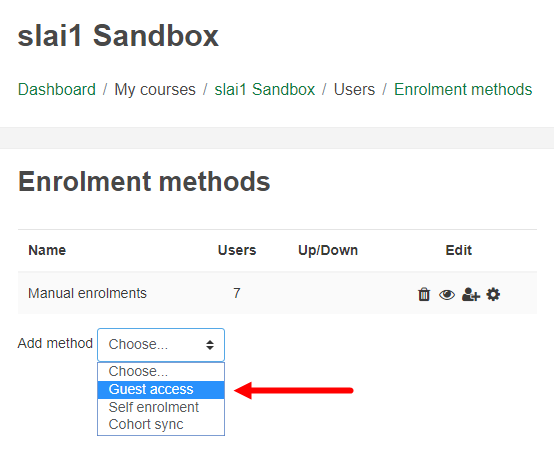 If Guest access is already in the list of enrollment methods, select the gear icon to edit its settings. You need to turn on the Guest Access method by ensuring that Allow guest access is set to Yes. If you want a bit more control over the guests who access your course via the url, you can also specify a password that users must enter when enroling themselves in your course. This password can be emailed to guest users along with the course url. Note: the 'Guest access' settings will not appear in the Course Settings until the Guest access enrolment method has been added as in Step 2 above. 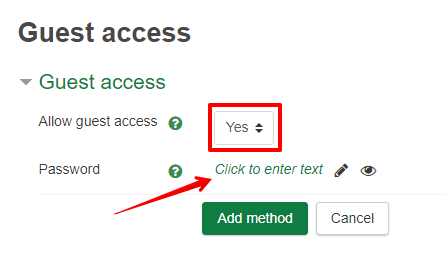 Once the Guest Access enrolment method has been enabled and turned on in your course, anyone at the U of A with a valid CCID can access it by going to the course url. You can copy this link and email it to your guest users (they will be redirected through the CCID login screen). Note: eClass does not have a visible course catalog so users will not be able to find the course by searching for it once they have logged in so you do need send them the url to access your course. Once you have enabled the guest enrolment method as described above, you have two options. The first is to direct people to the eClass portal, and have them use the guest access link to enter the eClass site as in the image below. Once on eClass, they would need to enter the url for the course (from the steps above) into their browser to access to course. In the example pictured above, the link to send would be https://eclass.srv.ualberta.ca/local/eclass/landing/guestlink.php?cid=2751. Note that you still have the option of setting and including a password in your email.